Citation: Graff, David. Arabic Gigaword Third Edition LDC2007T40. Web Download. Philadelphia: Linguistic Data Consortium, 2007. Arabic Gigaword Third Edition is a comprehensive archive of newswire text data acquired from Arabic news sources by the LDC at the University of Pennsylvania. Arabic Gigaword Third Edition includes all of the content of Arabic Gigaword Second Edition (LDC2006T02) as well as new data collected after the publication of that edition. 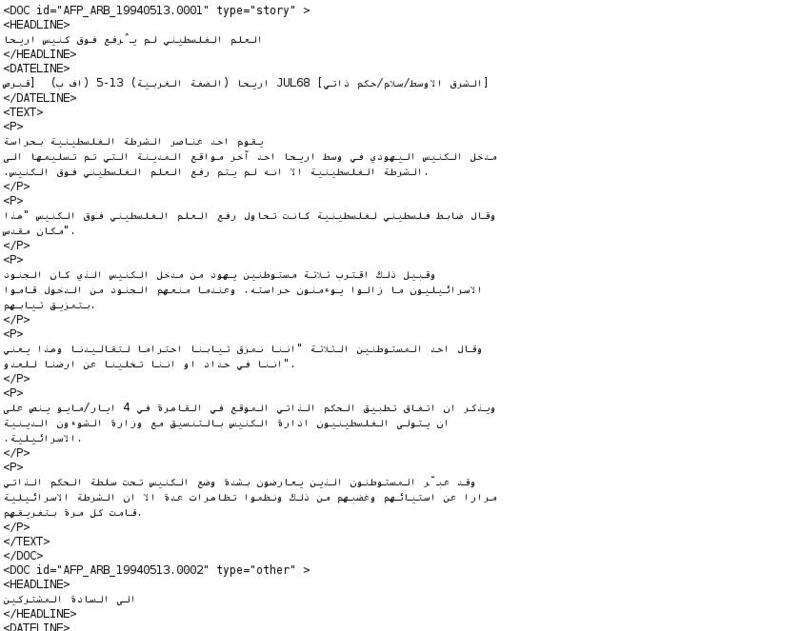 Also, an archive from a new newswire source -- Assabah -- has been included in the third editon. The seven-character codes in the parantheses above consist of the three-character source name IDs and the three-character language code ("arb") separated by an underscore ("_") character. This release contains 547 files, totalling approximately 1.8GB in compressed form (6,673 MB uncompressed) and 1,994,735 K-words. The table below shows data quantity by source under the following categories: data source (Source); the number of files per source (#Files); compressed file size (Gzip-MB); uncompressed file size (Totl-MB); the number of space-separated words tokens in the text (K-words) and the number of documents per source (#DOCs). All text files in this corpus have been converted to UTF-8 character encoding. Approximately 15,000 stories from older AFP files (1994 - 2002) contained very brief documents where the text content was not recognized as such; in those cases, the TEXT element appeared empty while the HEADLINE element contained anywhere from three to several lines of text. The content of these documents has been rearranged. The first line remains as the headline and the rest of the lines have been moved into the text segment. All stories of this sort had been originally classified as "other", and that classification has not been changed in this edition. Al Hayat data from 2002 and 2003 contained some Arabic-Indic digits, despite the intention to convert all digit strings to the ASCII digit characters for consistency. The digits have now been converted to the ASCII range. For more details about the encoding challenges presented by this data, see the readme file accompanying this corpus. Some Al Hayat data had stray angle-bracket characters (""), which have been rendered as "". There were also some defective "Doc-ID" strings (the 'id' attribute in the "" tag that begins each news story) in the January 2001 data. Some An Nahar data had "bare" ampersand characters ("&") which have been rendered as "&". Some Xinhua documents included empty sub-elements (HEADLINE, DATELINE and/or TEXT sections containing no data); when HEADLINE or DATELINE were empty, these tags were removed. When the TEXT segment was empty, the document as a whole was removed. In several Xinhua stories, the Doc-ID string, which is supposed to provide the year, month, date and sequence number for the story, had become garbled, yielding an incorrect or impossible date string. A separate data file in the "docs" directory, called "docid_changes.txt", lists the changes in document inventory and Doc-ID strings. Xinhua stories typically end with a formulaic Arabic string (meaning "end-of-story"), which should not have been included as part of the final paragraph in each story. In general, consistent line-wrapping was applied to make the overall text presentation consistent across all sources and with Gigaword releases in other languages. The markup pattern was also applied consistently for all sources without exception.